Opening up another digital pathway to reach audiences, Livestream announced last week its live video platform has landed on Roku media players. 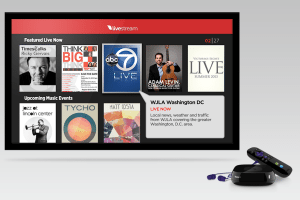 The arrangement brings New York-based Livestream’s service to the connected television market for the first time and gives Roku its first-ever live video feed, offering concerts, sports, and news content. Broadcasters that use Livestream, whether they are professionals or savvy novices, feed live video content to viewers using the platform. Prior to the deal with Saratoga, CA-based Roku, Livestream channels could be watched on the Web and through its mobile app. Now the company can feed video to connected televisions outfitted with Roku digital video devices. “We really need to be on every platform so you can consume the content wherever you are,” says Phil Worthington, Livestream’s co-founder and chief product officer. The company’s efforts to get inside TVs, set top boxes, video consoles, and other gadgets that may be in the living room, he says, follows the ever shifting ways the public consumes video. Democratizing the ability to broadcast live video is also part of Livestream’s strategy, Worthington says. By bringing down costs and simplifying the means of delivering such content, the company believes it can help more video producers reach the public. Instead of needing a van loaded with pricey broadcast gear to transmit live feeds from events, he says, Livestream’s service requires just a few small pieces of equipment. In addition to software, Livestream has also been developing more hardware to feed content from video cameras—professional as well as consumer-grade—to its platform. A line of control technology that allows producers to switch between cameras during live feeds, add graphics, and display picture-in-picture views has been in development. “It’s everything you might expect to see on TV, but it’s more accessible,” Worthington says. Thus far more than 60 local news stations in the U.S. use Livestream’s technology to deliver some of their broadcasts. Content from sources such as HBO, Marvel Comics, and Facebook can also be found on Livestream’s distribution channels. “We’ve been making a big push from consumer products into the more professional market,” Worthington says. All told, some 75,000 live events per month can be seen through Livestream. Just like on live television, where anything can happen, one piece of previously announced Livestream technology has been delayed a bit. Back in January at International CES, the company showed off an upgraded version of a wireless video broadcasting device built with the help of the Verizon Innovation Center in Waltham, MA. The device, which connects to video cameras, lets producers stream content through a built-in 4G modem that runs on the Verizon Wireless network. The model available on the market now runs on Wi-Fi as well as connects to external modems to stream content. Worthington says the updated broadcast device is currently in final testing, though a release date has not been set. “It’s in the lab right now awaiting approval,” he says.